The Miners have multiple impact players this season and have their sights set on making the playoffs for the first time since 2012. 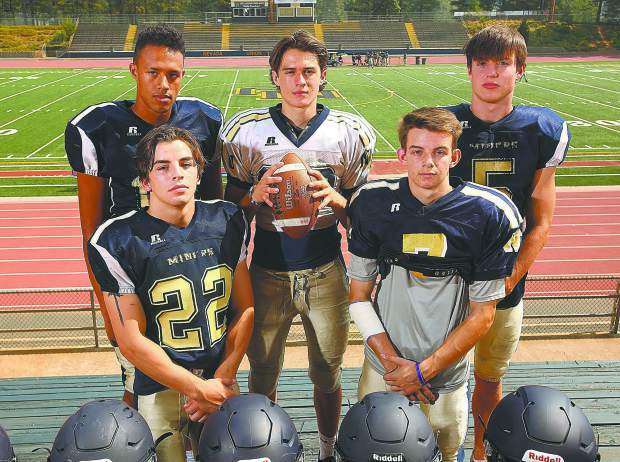 From left: Duke Morales, Cameron Dallago, Hayden Lee, Parker Heilaman, Dylan Hart, A.J. Meyer, Matthew Dal Bon and Dawson Fay. The Miners have multiple impact players this season and have their sights set on making the playoffs for the first time since 2012. Back row from left: Cameron Dallago, Parker Heilaman and Dawson Fay. Front row from left: Hayden Lee and A.J. Meyer. 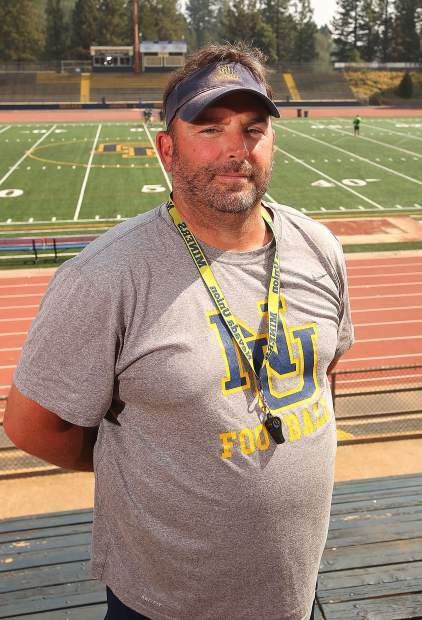 Nevada Union's new head coach Brad Sparks has brought a new energy to the program and his players are buying in. From left: Matthew Dal Bon, Duke Morales, Hayden Lee, Brad Sparks, Dylan Hart, Parker Heilaman, Cameron Dallago and A.J. Meyer. 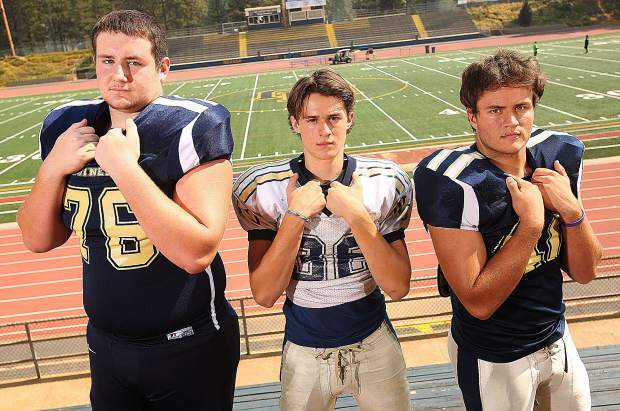 Offensive linemen Dylan Hart, left, and Matthew Dal Bon, right, will be tasked with protecting quarterback Parker Heilaman, center, this season. Key returners: Dawson Fay (RB, LB), Hayden Lee (RB, NT, LB), Parker Heilaman (QB, CB), Cameron Dallago (TE, S), Duke Morales (LB), Jaxon Horne (RB, S), AJ Meyer (WR, CB), Matthew Dal Bon (OL, DL), Dylan Hart (OL, DL). Coaching staff: Brad Sparks (head coach), Jim Rubiales (Def. Coordinator), Chad Mason (QB coach), Ernie Flores (RB coach), Jason Horne (WR/CB Coach), Jon Peek (Kicking Coach), Tyler Droivold (Def. line), Jamie Wise (Trainer). With a new man in charge, a new league to call home and a new energy permeating the program, the Nevada Union Miners football team is optimistic about its prospects in 2018. Senior tight end and safety Cameron Dallago said the new energy around the program is obvious and engaging. Much of that optimism and energy has been generated by new head coach Brad Sparks, who took over a program that hasn’t made the playoffs since 2012. Sparks brings more that two decades of coaching experience to the position. 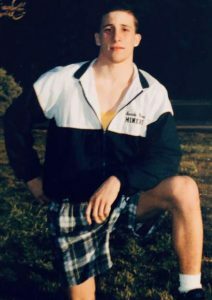 He spent 17 years coaching various levels at Marysville High School, including four years as the head varsity coach. He has also held multiple positions with the Nevada Union program dating back to 2012. 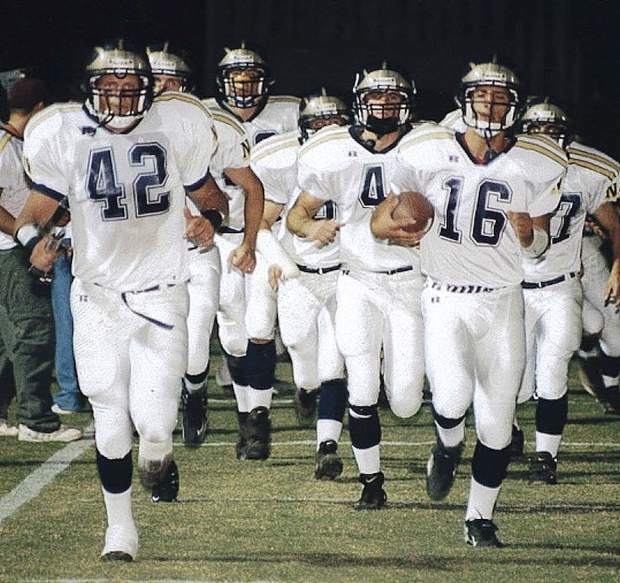 He is the 11th varsity head coach in Nevada Union football history and the third since 1991. For Sparks, his objective is to make a difference in his player’s lives and win games in the process. “This school has gone through enough loss and being able to be positive and bring positivity has been my favorite part so far,” he said. Nevada Union has had no shortage of elite running backs in the school’s history, and this year is no different. The Miners return an all-league first teamer in Fay, who is coming off a strong junior season in which he led the Sierra Foothill League in rushing (1,173 yards). “I have very high expectations for my team and myself, especially for myself,” said Fay who is entering his third year as a varsity starter. Joining Fay in the backfield is Lee, a 5-foot, 9-inch, 185-pound back who didn’t get a lot of carries last season, but has impressed coaches in practice. 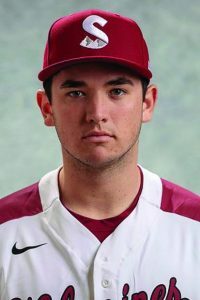 “Hayden Lee could start for anyone in our league and probably Northern California,” said Sparks. Sophomore Jaxon Horne will also be featured out of the backfield this season. Sparks said he expects good things from the 6-foot, 180-pound Horne. Nevada Union also has skilled backs in Isreal Gonzales and Dereck Lopez. “In 25 years of coaching high school football, I don’t think I’ve ever had this much talent in the backfield,” said Sparks. Nevada Union will have a new face under center this season as senior Parker Heilaman takes over the starting quarterback role. Heilaman played mostly on defense last season and has yet to attempt a pass in a varsity game, but has shown he is ready for the task with strong showings during summer practices and 7-on-7 matchups. Heilaman will have outside targets in junior receiver A.J. Meyer and senior receiver Dylan McGilvary. Holding down the tight end position is Dallago, who said he has a great rapport with Heilaman. Protecting Heilaman and opening holes for NU’s ball carriers is a relatively inexperienced but hungry group of offensive lineman. Anchoring the line is senior center John Low (5-10, 285 pounds). A pair of juniors hold down the guard positions in Matthew Dal Bon (6-1, 235 pounds) and Sammy Slay (5-9, 170-pounds). Bookending the offensive line is tackles Dylan Hart (6-9, 370 pounds) and Christian Espinoza (6-1, 220 pounds). The Miners have installed new defensive coordinator Jim Rubiales’ 5-2-4 defense and are hoping it puts some more pressure on opponents. 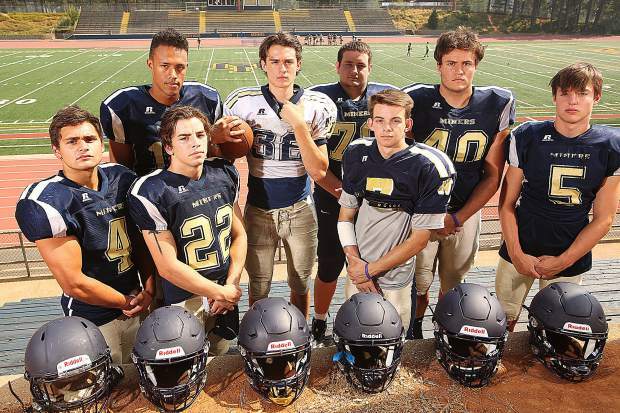 Nevada Union struggled to get to the quarterback a season ago, notching just five sacks on the season, but that wasn’t the only area the defense faltered. The Miners gave up 34.1 points per game last season, and allowed more than 40 points in a game five times. Nevada Union’s defensive line will feature Lee, Dal Bon, Espinoza, Carlos Reyna, Liam Ferguson and Taylor Martines. At the linebacker position Duke Morales steps into the middle linebacker position, taking over for 3-year varsity starter Justin Houlihan who graduated. Fay will also see lots of reps at linebacker. In the secondary, Horne and Dallago will hold down the safety positions, while Meyer, McGilvary and Lopez will be tasked with cornerback duties. The Miners enter the season in the wake of a tragedy that took the lives of two of their teammates. Tyler Nielson and Justin Gardner died after being involved in an auto accident with an alleged drunk driver in March. The Miners are using that tragedy as a motivator this season. Lee will be wearing Gardner’s No. 10 number to honor his friend and teammate. “It’s motivation for me and for everybody on the team,” Lee said. 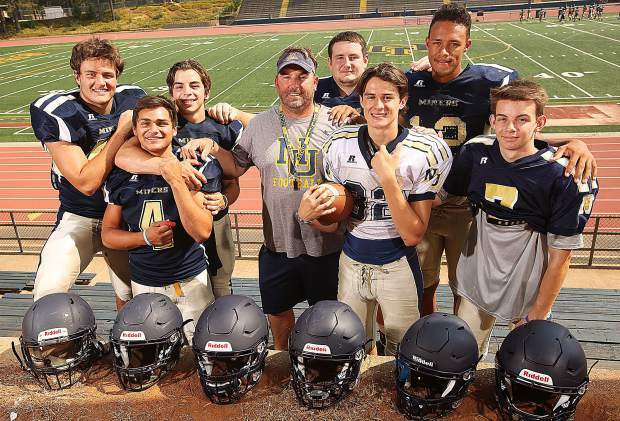 The Miners have left the Sierra Foothill League and now take up residency in the newly formed Foothill Valley League where they will face league foes closer to their own enrollment. Nevada Union is joined by Lincoln, Oakmont, Placer, Ponderosa and Rio Linda. The Miners kickoff their league slate at Placer Sept. 28. The Hillmen won the Sac-Joaquin Section Division IV title and came up just short of winning a state championship a season ago. Nevada Union opens the 2018 season on the road, traveling to Yuba City to face the Honkers. 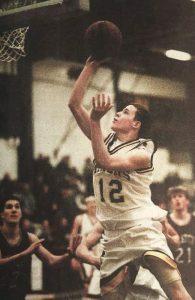 The last time the Miners and Honkers faced off was in 2005. NU won that game, 35-21. This year’s game is scheduled to get started at 7:15 p.m., Friday.